Britomart welcomes Tiffany & Co.
Britomart welcomes Tiffany & Co.’s first New Zealand flagship store, inside the stunning Australis Nathan building. 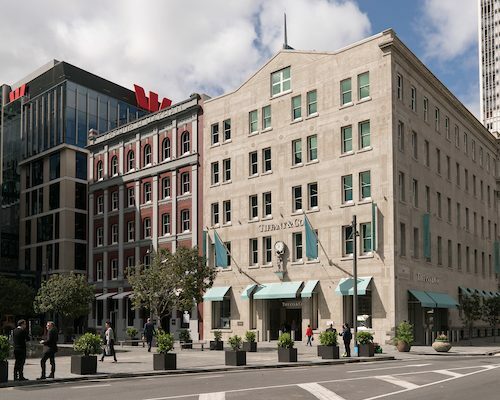 Over a century ago, around the time a young Teddy Roosevelt famously purchased a diamond engagement ring from a New York jeweller, two buildings were being built on the other side of the world on Auckland’s Customs St. Today, those buildings stand as one – Australis Nathan- and their newest tenant is that very jeweller, the now iconic Tiffany & Co.
Tiffany & Co. hold a time-honoured reputation as a company who produce an exquisite product and who’ll only be housed in the best surrounds, so it was a perfect fit for the brand to choose Australis Nathan for their first standalone New Zealand store. Technically, Tiffany & Co. occupy the ground floor of the old Australis House but after Cooper and Company joined the two buildings in 2015, the pair are known as the one “Australis Nathan” name. Restoration of the site has been an 18-month-long process; a significant project in more ways than one. As well as these being the first of Britomart’s buildings to be developed with premium grade floors, perhaps the most notable adaptation has been the way the buildings have effectively been ‘turned around’ to face the harbour rather than busy Customs St as originally intended. Today, and going forward, harbour views are a considerable bonus but when building began in 1903, tenants wanted nothing more than to turn their backs on the sea, which represented hard labour, sickness and danger. Today, the grand entrance to Tiffany & Co. stands on the seaward side facing the newly renovated, shared-space Takutai Square. The special finish to the exterior of the building’s new frontage was inspired by a traditional Italian technique called “sgraffito” whereby layers of plaster are applied and patterns are delicately scratched to reveal parts of the underlying layer. It’s an exquisite site for a top-tier new resident and at 470m2 it is Britomart’s largest retail site to date. With a superb fit-out featuring marble and amazonite floors, polished stainless steel and custom furnishings inspired by the stained glass works of Art Nouveau designer Louis Comfort Tiffany, son of the company’s founder Charles Lewis Tiffany, the store will be an elegant space for shoppers to peruse the brand’s latest collections. From fancy coloured diamonds, to the fine and sterling silver jewellery, exclusive designer collections from Elsa Peretti, Paloma Picasso and Jean Schlumberger and signature collections such as Tiffany Atlas and Tiffany T, there will be a full complement on offer.